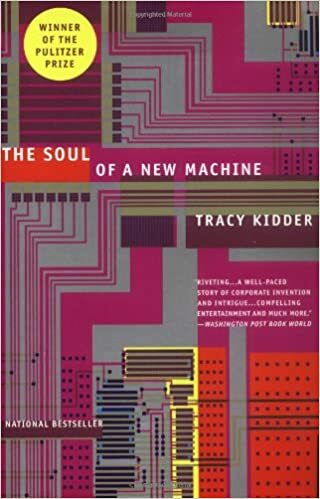 I listened to The Soul of A New Machine by Tracy Kidder as an Audible audio book on my drive from Boston to NYC and back. It is a rather fast-paced and intense story of the team behind the Data General Eclipse MV/8000, code named Eagle, a 32-bit minicomputer. The book gets into the heads of the various engineers of the project and explains various sub-systems in layman’s terms, as well as, how the engineers think of the particular system. You are introduced to a cast of characters quickly termed the Hardyboys and the Microkids based on which subsystems they work on, hardware or the microcode of the processor. These engineers become engulfed in the project and after some time produce the first prototypes Coke and Gollum. From here flows a story of debugging, commitment, and a little bit of insanity. There are some interesting concepts related to management of a team, and project too. Most of these relate to how Tom West decouples his team from the minutia of making a product, and corporate politics. This ultimately makes the product possible since the engineers can spend their time acting as a group of close collaborators working on technology. After listening to this book I suddenly want to work on an intense and groundbreaking project, as well as, build a IC-based CISC processor myself.